Zigzagger Cozy House Slippers – Refreshing Your Daily Life with Warmth & Fashion!Why Choosing Zigzagger Slippers:- The slippers adopt fashionable & classic Moccasin style- You will really feel cozy and warm wearing the fleece slippers and memory foam insole gives you unique soft feeling- Breathable material prevents sweaty feeling- You can walk steadily indoor and outdoor with versatile rubber sole- They are made of high quality materials with excellent craftsmanship- Ultralight weight- They are machine washable and will remain fresh like brand new after countless wash cycles- 100% no risk money-back guarantee and 24/7 after-sale service- Pamper the hard working husband, dad, or best friend in your life by giving his tired feet a well deserved restOur Story:Zigzagger was founded in 2008. It is a modern brand specializing in R&D and sales of home slippers. In the past ten years, we have always adhered to the business philosophy of health, comfort and safety. We continue to innovate and upgrade our products with the spirit of craftsmanship, and provide higher quality home slippers for those who live in the love of life!Treat your feet and grab a pair today! 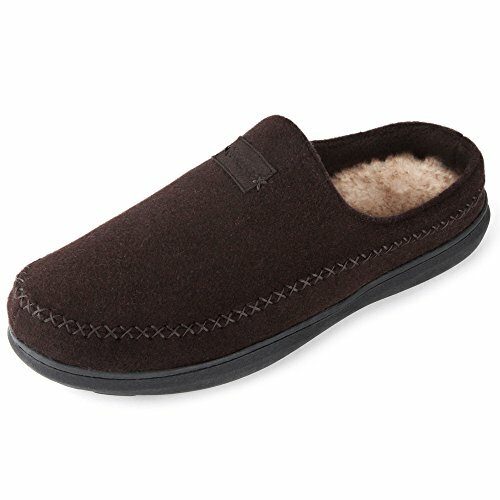 – RISK FREE – Click ‘Add to Cart’ above to get yours now!✅ 【Fashionable & Classic Moccasin Style】The causal moccasin slippers are made of quality & durable micro suede material and easy slip on. The manually craftsmanship whipstitch adds the exquisite & meticulous feeling of these custom fit footwear. ✅ 【Ultimate Comfy Memory Foam & Warm Lining】 Padded with high-density memory foam, the slippers will mold to your feet giving you a custom fit for maximized comfort and makes you feel like you’re walking on a soft cloud. Faux sheepskin & plush fleece lined offer next-to-skin comfort to keep you warm and cozy in autumn and cold winter. ✅ 【Open Back & Low Heel Design】 The open back design of slippers prevents sweaty feeling and the low heel helps your slippers stay on when walking up/down stairs at home. ✅ 【Versatile Rubber Sole】 The durable, slip resistant, gripped rubber sole makes for the perfect indoor and outdoor slippers. This Zigzagger footwear will provide you with all the flexibility and support you need. You can also wear it as regular shoes when taking the dog for a walk, walking to the mailbox or taking the garbage out. ✅ 【Easy to Maintain】 The excellent craftsmanship and the quality of materials we use make the faux fur lined clog slippers very easy to maintain. Machine washable material lets you easily clean off stains or dirt, and the slippers will not lose its form even after many washes. Available in small (7 & 8), medium (9 & 10), large (11 & 12), and x-large (13 & 14) – Click ‘Add to Cart’ to get yours and pamper your feet right now!